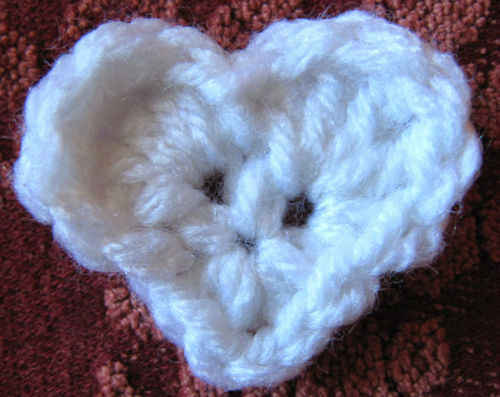 GAUGE: 1 motif = 7” (18 cm) from point to point; Rounds 1–3 = 4” (10 cm) in solid motif; 7 sts = 2” (5 cm) in half double crochet. CHECK YOUR GAUGE. Use any size hook to obtain the gauge. sm shell (small shell) = (2 dc, ch 2, 2 dc) in indicated space. lg shell (large shell) = (3 dc, ch 2, 3 dc) in indicated space. Adjustable-ring method = Wrap yarn in a ring, ensuring that the tail falls behind the working yarn. Grip ring and tail firmly between middle finger and thumb. Insert hook through center of ring, yarn over (with working yarn) and draw up a loop. Work stitches of first round in the ring, working over both strands (the tail and the ring). After the first round of stitches is worked, pull gently, but firmly, on tail to tighten ring. Join with hdc = Place a slip knot on hook, yarn over, insert hook in indicated stitch, yarn over and draw up a loop, yarn over, draw through all 3 loops on hook. 1. 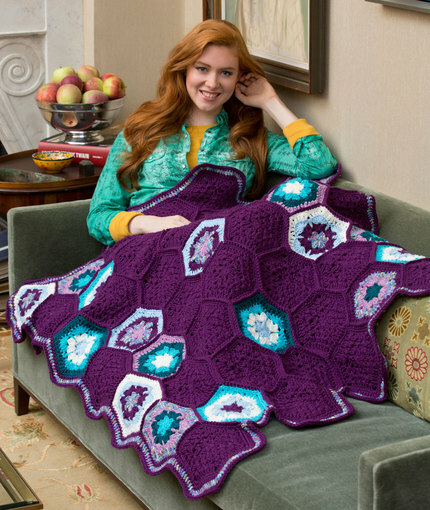 Throw is made from 53 hexagon-shaped motifs worked in joined rounds. Thirty motifs are solid-colored and 23 motifs are worked in 7 multicolor sequences. 2. 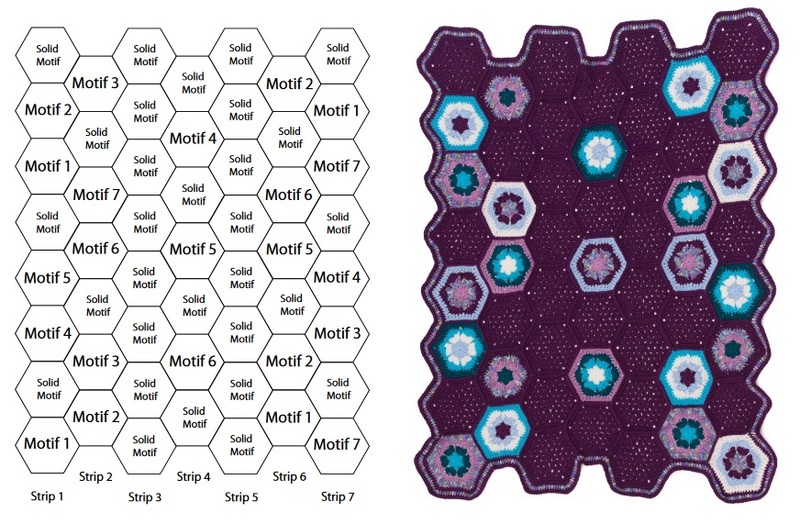 Refer to assembly diagram when joining motifs in strips. Strips 2–7 are joined as you go to strips 1–6. 3. Work all joining rows in the same direction for a uniform appearance. Round 1 (right side): Ch 3 (counts as first dc here and throughout), (dc, [ch 2, 2 dc] 5 times) in ring, ch 2; join with slip st in top of beginning ch, turn—12 dc and 6 ch-2 spaces. Pull gently, but firmly, on tail to tighten ring. Round 2: Slip st in next dc, slip st in first ch-2 space, (ch 3, dc, ch 2, 2 dc) in same space (first sm shell made), sm shell in each ch-2 space around; join with slip st in top of beginning ch, turn—6 sm shells. Round 3: (Slip st, ch 3, dc) in space between first and last sts, *sm shell in ch-2 space of next shell, 2 dc in next space between shells; repeat from * around; join with slip st in top of beginning ch, turn—6 sm shells and 12 dc. Round 4: (Slip st, ch 3, dc) in space between first and last sts, *sm shell in ch-2 space of next shell, 2 dc in next space between last shell and next 2 dc, 2 dc in next space between last 2 dc and next shell; repeat from * around to last shell, sm shell in ch-2 space of last shell, 2 dc in last space between last shell and next 2 dc; join with slip st in top of beginning ch, do not turn—6 sm shells and 24 dc. Round 5: Ch 1, sc in same st as join, *sc in each st to next ch-2 space, 3 sc in next ch-2 space; repeat from * around, join with slip st in first st—66 sc. Fasten off. With first color, make an adjustable ring. of beginning ch—18 dc and 6 ch-2 spaces. Fasten off. Pull gently, but firmly, on tail to tighten ring. 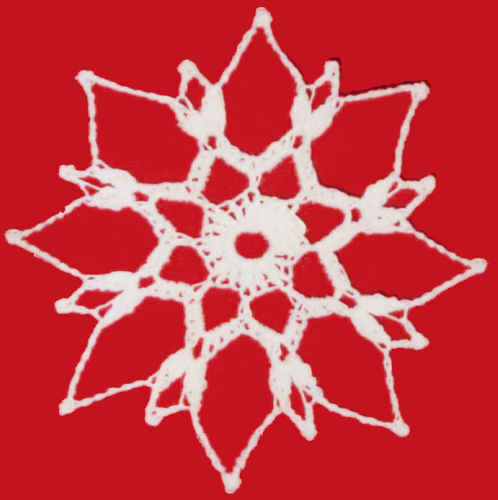 Note In remaining rounds, join yarn with right side of motif facing. Round 2: Join 2nd color with slip st in any ch-2 space, (ch 3, 2 dc, ch 2, 3 dc) in same space (first lg shell made), lg shell in each ch-2 space around; join with slip st in top of beginning ch, turn—6 lg shells. Fasten off. Round 3: Join 3rd color with slip st in any ch-2 space, ch 3, 6 dc in same space, *dc in next space between shells, 7 dc in ch-2 space of next shell; repeat from * around, dc in last space between shells; join with slip st in top of beginning ch, turn—48 dc. Fasten off. Round 4: Join 4th color with hdc in first st, [ch 1, hdc in next st] twice, *(ch 1, hdc, ch 2, hdc) in next st, [ch 1, hdc in next st] 3 times, skip next st**, [ch 1, hdc in next st] 3 times; repeat from * 5 times ending at **; join with slip st in top of first hdc—48 hdc, 48 ch-1 spaces, and 6 ch-2 spaces. Round 5: Ch 1, sc in same st as join, *sc in next 3 ch-1 spaces, 3 sc in next ch-2 space, sc in next 3 ch-1 spaces**, sc in next 2 sts; repeat from * 5 times ending at **, sc in next st; join with slip st in first sc—66 sc. Fasten off. Use assembly diagram as a guide. Work all stitching in the same direction. leave remaining sts unworked. Fasten off. Repeat to join 8 motifs in each odd-numbered strip and 7 motifs in each even-numbered strip. group at bottom of strips. Fasten off. Repeat to join next strip to preceding strip. Always join yarn with right side facing. Round 1 (right side): Join A with hdc in center st of any 3-sc group at an outer corner, 2 hdc in same st, hdc ineach st around working 3 hdc in center st of each 3-sc group at an outer corner; join with slip st in first hdc—734 hdc. Round 2: Join G with hdc in center st of any 3-hdc group, 2 hdc in same st, hdc in each st around working 3 hdc in center st of each 3-hdc group; join with slip st in first hdc —798 hdc. Round 3: With A, repeat Round 2—862 hdc.